Host Family Math Nights at your middle school—starting today! 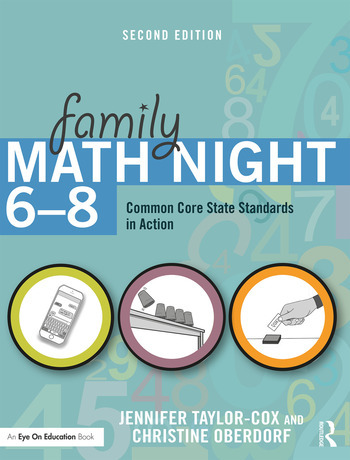 Family Math Nights are a great way for teachers to get parents involved in their children’s education and to promote math learning outside of the classroom. In this practical book, you’ll find step-by-step guidelines and activities to help you bring Family Math Nights to life. The enhanced second edition is aligned with the Common Core State Standards for Mathematical Content and Practice with new activities to help students explain their answers and write about math. It also comes with ready-to-use handouts that you can distribute during your event. With the resources in this book, you’ll have everything you need to help students learn essential math concepts—including ratios and proportional relationships, the number system, expressions and equations, geometry, and statistics and probability—in a fun and supportive environment. The book is organized by math content, so you can quickly find activities that meet your needs. Each activity is easy to implement and includes a page of instructions educators can use to prepare the station, as well as a page for families that explains the activity and can be photocopied and displayed at the station. All of the family activities can be photocopied or downloaded from our website, www.routledge.com/9781138200999, so that you can distribute them during your event. Why should our school have Family Math Night? How are the activities connected to the Common Core State Standards? Why should we use manipulatives in mathematics? Why is "Get Students Talking About Math" included? Why is there a challenge for each activity? What are some additional tips for a successful Family Math Night? What is the teacher’s role during Family Math Night? Jennifer Taylor-Cox is owner of Taylor-Cox Instruction, LLC. She serves as an educational consultant for numerous districts across the United States. She teaches university courses in education and is author of 11 Routledge Eye on Education books. Christine Oberdorf is an administrator with Montgomery County Public Schools in Maryland.